There’s a new(ish) kind of TV in town and it’s called QLED. Samsung coined and trademarked the term, announcing the first QLED TVs at CES 2017, but it isn’t keeping that acronym entirely for itself. Sources at Samsung tell Digital Trends they would like to see other companies adopt the QLED moniker for their quantum-dot infused LED TVs, too. To prove it, the South Korean electronics giant forged a partnership with Chinese manufacturers Hisense and TCL, announcing a QLED Alliance in late April 2017, and TCL now has a QLED line of TVs. As you may have surmised, an alliance implies there is an enemy, and in this case, that would be OLED. Sounds like it’s time for a QLED versus OLED TV battle! QLED refers to an LED TV using quantum dots to enhance its performance. OLED TVs have received high praise from tech journalists and reviewers across the board, including Digital Trends; LG’s C8 OLED won our praise as the best TV in 2018, for example. But until recently, LG was the only name in the OLED game, and premium price tags long put them out of reach of most consumers. Now that Sony is bringing competition to the market with its own amazing-looking OLED TVs and LG’s OLED lineup has expanded to include more affordable models, the heat is on QLED technology. Samsung seems poised to meet the challenge, though, updating the technology in subsequent QLED lines to try and close the gap. For those reasons – not to mention the word QLED looks and sounds a lot like OLED — it’s important to compare the merits of these dueling display technologies. First, we’ll discuss what each technology is (and isn’t) before pitting them against each other in a point-by-point battle for supremacy. Generally speaking, QLED TVs are just LED TVs that use quantum dots to enhance performance in key picture-quality areas. Samsung, however, claims its QLED TVs are special, offering brightness levels that exceed any competing TV technology, better black levels than other LED TVs, and more colors than LED TVs without quantum dots can reproduce. How? Quantum dots act almost like a filter that produces purer light than LEDs alone can provide. It’s complicated, but you can learn all the science behind QLED here. To meet the Ultra HD Alliance’s standards for an Ultra HD Premium TV, most LED TVs must use quantum dots in some fashion. Since quantum dots are now deployed so widely across premium TVs, Samsung thinks it would reduce confusion if every manufacturer just started calling them QLED TVs. The goal is to differentiate them from mere LED TVs and push back against OLED, as Samsung has no plans to produce an OLED TV at this time. The company does have another OLED competitor in the works called MicroLED. This is a separate technology from QLED TVs, so it won’t factor in here, but based on what we saw at CES 2019, MicroLED has the potential to bring its own serious competition to OLED in the not-so-distant future, especially with regards to brightness and black levels. Unlike plasma, OLED, or MicroLED, QLED is not an emissive display technology. Quantum dots don’t directly emit the colors you see; they’re spread on a piece of film that acts almost like a filter within an LED TV panel. LED backlights beam through this film, the light is refined to an ideal color temperature, and from there, brightness and color are significantly enhanced. If quantum dots produced light on their own, QLED could be called an emissive display — but they don’t. OLED stands for organic light-emitting diode. Simply put, OLEDs are made with organic compounds that can light up individually when fed electricity — hence the term emissive display. A single OLED is the size of one pixel, so it takes millions of them lighting up and shutting off independently to fill your TV screen. Because of this flexibility, when an OLED TV’s pixels are shut off, they are completely off and appear completely black. While QLED TVs can be made very thin, OLED TVs can be made even thinner, and can even be flexible. Let’s start by examining how these two technologies stack up in terms of contrast, viewing angle, brightness, and other performance considerations. A display’s ability to produce deep, dark blacks is arguably the most important factor in achieving an excellent picture quality. Deeper blacks allow for higher contrast and richer colors (among other things) and, thus, a more realistic and dazzling image. When it comes to black levels, OLED reigns as the undisputed champion. QLED TVs improve on LED display black level performance, but they still rely on backlights shining behind an LCD panel. Even with advanced dimming technology, which selectively dims LEDs that don’t need to be on at full blast, QLED TVs still suffer from an effect called “light bleed,” as the backlight spills through on what is supposed to be a black section of the screen. The result is a slight haze or “halo” around bright objects which blurs lines that should be sharp, noticeable in scenes with bright stars on a night sky, or in the letterbox bars at the top and bottom of a movie. These issues have been around since long before the advent of QLED, and they’re inherent to the nature of the panels, but in 2018 Samsung made a quantum leap (sorry), improving black levels and off-angle picture performance to near-OLED levels via a new anti-reflective layer in the panels. We expect the gap to continue shrinking in 2019 as QLED tech grows. OLED TVs don’t suffer from these problems. If an OLED pixel isn’t getting electricity, it doesn’t produce any light stays totally black. Sounds like an obvious choice to us. QLED TVs have a considerable advantage when it comes to brightness capability. LED TVs were already good at getting extremely bright, but the addition of quantum dots allows them to get even brighter. Because of this, QLED TVs claim superior “color volume,” meaning they are able to make all colors in the available spectrum brighter without losing saturation. QLED TV makers also claim they are better for HDR content because spectral highlights in images – the glint of light reflecting off a lake or a shiny car, for instance – are more powerful and more easily visible. In rooms with a lot of ambient light, a QLED’s brightness advantage can be very helpful. When it comes to that HDR argument, though, much can be said for the total contrast afforded by an OLED TV’s perfect black levels. When you start from perfect black, perceived contrast requires less intense brightness in those highlighted areas for HDR programming, and the end result for the viewer is similar to that of a much brighter QLED TV — at least in a dark room, anyway. In rooms with a lot of ambient light, a QLED’s brightness advantage can be very helpful for delivering that big visual punch HDR content should deliver. Samsung’s 2018 flagship models — the Q9 and Q8 — added full array local dimming, which only adds to the company’s advantage in terms of peak luminance. A new anti-reflective coating, along with other panel improvements, has also reduced the halo — or, blooming — effect TV reviewers complain about. Brightness without some of the LED disadvantages? That’s looking very appealing, indeed. OLED used to rule this category, but quantum dots, by improving the purity of the backlight, have allowed QLED TVs to surge forward in color accuracy, color brightness, and color volume, putting them in a dead heat with OLED TVs. Again, QLED makers claim better-saturated colors at extreme brightness levels to be an advantage, but we have yet to witness this technical claim resulting in a real advantage in normal viewing situations. Samsung has implemented expanded color volume in its 2018 QLED models, which could improve saturation at higher brightness levels, but we don’t really have enough evidence to declare it a success. Response time refers to the time it takes for each individual diode to change from “on” to “off.” With faster response time comes less motion blur and fewer artifacts (source material notwithstanding). OLED, with its smaller diodes working as single pixels, simply blows QLED out of the water in terms of response time. The diodes in QLED TVs are not only slower, but they also sit behind the LCD panel and illuminate clusters of pixels, not individual ones. This causes an overall slower change between “on” and “off” states. In fact, OLED currently offers the fastest response time of any TV technology in use today, making it a clear winner in this regard. That said, Samsung equipped all its 2018 QLED televisions with support for variable refresh rate, which should drastically improve performance for those playing multiplayer games with unreliable frame rates. As for input lag, LG has considerably improved its OLED TVs in this area, making them a real option for gamers who play competitive multiplayer titles, and Sony’s aren’t far behind (hovering around 30 milliseconds). We do know that OLEDs aren’t an inherently bad choice for gamers, but which models will have the least input lag remains to be seen. It’s also hard to rank OLED against its QLED competition because the input lag on QLED TVs varies so greatly from model to model. Suffice it to say that OLED is certainly an option for gamers, and we’re interested to see how they perform moving forward. OLED, again, is the winner here. With QLED screens, the best viewing angle is dead center, and the picture quality diminishes in both color and contrast the further you move side to side, or up and down. While the severity differs between models, it’s always noticeable. LG produces a type of LCD panel known as IPS which has better off-angle performance than VA-type LCD panels, but it’s still no competition for OLED technology, and usually suffers when it comes to black levels. Samsung’s highest-end QLED TVs feature updated panel design and anti-reflective coating, which make off-angle viewing much less of an issue. While OLED still beats these models out in the end, the gap is closing quickly. OLED screens can be viewed with no luminance degradation at drastic viewing angles — up to 84 degrees. Some QLED TVs have improved in terms of viewing angle, and (as mentioned) Samsung’s anti-reflective layer helps a ton here, but OLED maintains an advantage. OLEDs have come a long way in this category. When the tech was still nascent, OLED screens maxed out at 55 inches. 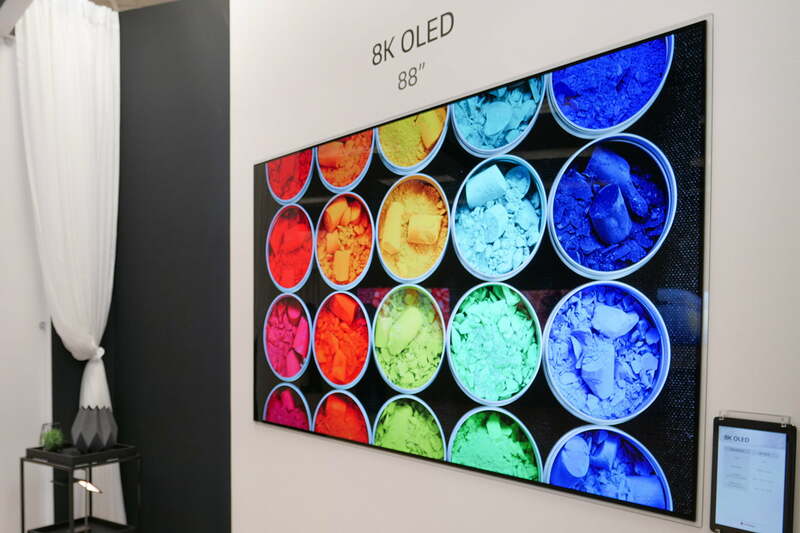 Today, an 88-inch OLED is available. With that said, there are fewer limitations on LCD display sizes, with QLED growing as large as 100 inches and beyond. 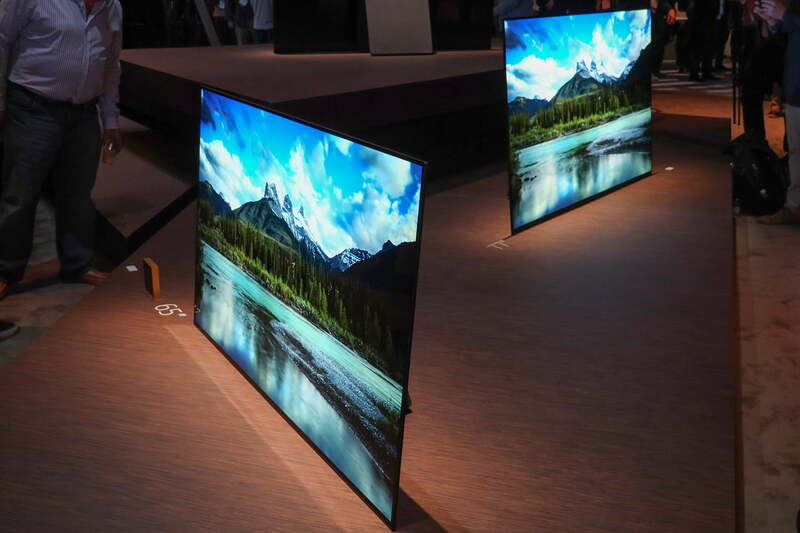 At CES 2019, LG showed off an 88-inch 8K OLED which is expected to come to market this year, while Samsung has an 85-inch 8K QLED TV for sale now. For most folks (and budgets), this isn’t a significant advantage, but technically speaking, QLED has a slight edge at present. LG says you’d have to watch its OLED TVs five hours per day for 54 years before they fell to 50 percent brightness. Whether that’s true remains to be seen, as OLED TVs have only been out in the wild since 2013. For that reason — and that reason only — we’ll award this category to QLED. It pays to have a proven track record. We include this section begrudgingly. Despite persistent concerns, the reality is that the effect will not be an issue for most folks. The effect we’ve come to know as “burn-in” (which is actually a misnomer) stems from the days of the boxy CRT TV, when the prolonged display of a static image would cause that image to appear to “burn” into the screen. What was actually taking place was the phosphors that coated the back of the TV screen would glow for extended periods of time without any rest, causing them to wear out and create the appearance of a burned-in image. We think this should be called “burn out,” but we digress. QLED TVs aren’t susceptible to burn-in. The same issue is at play with OLED TVs because the compounds that light up do degrade over time. If you burn a pixel long and hard enough, you will cause it to dim prematurely and ahead of the rest of the pixels, creating a dark impression. However, in reality, this is not very likely to cause a problem for most viewers — you must essentially abuse the TV intentionally in order to achieve this result. Even the “bug” (logographic) that certain channels use disappears often enough or is made clear so as to avoid causing burn-in issues. You’d have to watch ESPN all day every day (for many days) at the brightest possible setting to cause a problem, and even then it still isn’t very likely. That said, the potential is there, and it should be noted. Gamers in particular who leave their TV on while a static image remains on-screen, or who play for 10 hours a day for many weeks at a time could potentially cause some “burn-in” on an OLED TV. We would advocate for a shift in behavior (maybe go outside once in a while and turn off that TV when you do?). But, since QLED TVs aren’t susceptible to burn-in, they win this fight by technicality. OLED panels are extremely thin and require no backlight. As such, OLED TV’s tend to be lighter in weight than QLED TVs and thinner. They also require less power, making them more efficient. As you’ve probably ascertained by now, LG makes OLED TV panels, but other manufacturers take those panels and put them in their televisions. As a result, different OLED TVs have vastly different operating systems and features, so we can’t really comment on accessibility or usability without going one-by-one. However, we can say without a shadow of a doubt that Samsung has made its TVs — including, of course, the QLED family — quite simple to set up and use. So long as you’ve got Samsung’s SmartThings app, newer models will automatically draw information from your smartphone, allowing them to download all your streaming apps and log you in with a single tap (they’ll do the same for Wi-Fi). That’s not all — Samsung’s gapless mount system and Invisible One Connect box make mounting a QLED and hiding cables shockingly simple. Samsung’s Tizen OS is snappy and easy to manage, too. Once upon a time, this category would be handily won by QLED TVs, but OLED TVs have come down in price, and since we’re talking all-premium here, comparable QLED TVs cost about the same (or more). The price category simply isn’t a consideration in this particular fight. QLED comes out on top by just a hair thanks to multiple advantages including brightness capability, accessibility, size, and lifespan, and with recent tweaks, black levels and off-angle viewing have also improved. For many, a QLED TV will make more sense than OLED since QLED displays will offer a punchier picture during daylight hours. When pitting QLED versus OLED in terms of picture quality, however, OLED is the clear winner, even though QLED represents a significant advancement over the LED TVs of old. OLED offers the best viewing angle, the best black levels, better contrast, and is also lighter, thinner, and uses less energy. Especially when the lights go down, OLED is a more attractive choice. As such, you’ll have to decide which TV is right for you, and either of these technologies is likely to be a major step up in picture quality and overall performance for most of us.